Over the past 20 years, I’ve worked with hundreds of entrepreneurs and brands across the globe. I’ve directed brand births, re-brands, campaigns, events, and an eclectic array of creative and innovative ventures. I’ve played the roles of Operations Director, Creative Director, Brand Director, User Experience (UX) Designer, and other similar roles. I see everything as a system, process, and belief that can be optimized for your success. If you represent a brand that is driven by the desire to consistently delight your audience and ensure that your methods of operation contribute to the vitality of people and planet, I’d love to have the opportunity to guide you in your journey. // Design your company values and develop a thriving brand culture. // Create a compelling brand story that captivates your audience. // Define the greatest values and traits of your brand and articulate them clearly. // Develop your values, ethics, and impact. // Foster a thriving, inspiring work environment. // Learn how to truly understand and connect with your audience. // Create “Loyal Brand Ambassadors”, communities, and tribes. // Declutter your brand and clarify your message. // Learn how to master the art of decision making within “seven breaths”. // Learn the fundamental psychology of strategic aesthetics and image. // Create strategic formulas and filters that you can utilize in any situation. // Design an Integrated Identity that will afford you the brand you want. // Create systems that bolster creativity, efficiency, and effectiveness. In this program, I actually work with you to build your Brand Profile as we go through the coaching process. For a more comprehensive brand development program, please view the options below. When we meet together for our first discussion, we'll determine your needs and come up with a custom Scope of Work (SOW). Once we've established that, I'll send you a proposal for a program that is specifically catered to your needs. Most custom programs for small to midsized businesses range from around $8,333 - $18,633, depending on production needs. 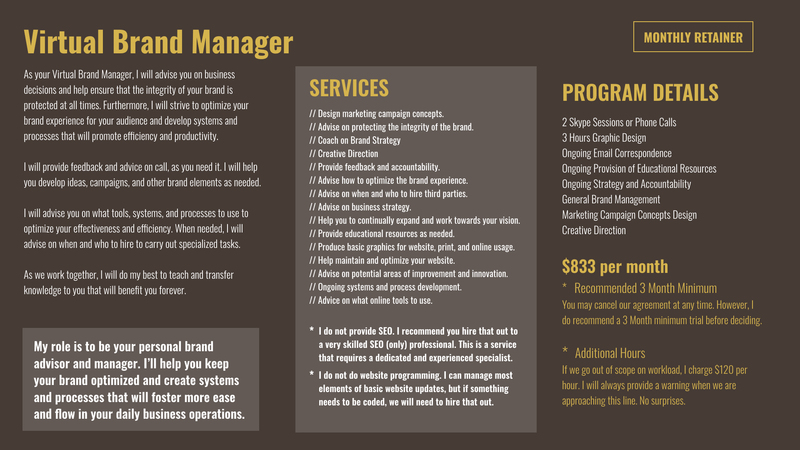 I also have programs for larger brands, ongoing consulting, and Virtual Brand Architect services. If you're interested in a custom program, just indicate this in the form (for all applicants) below. Thanks so much! For brands that I have already built or brands that just want someone to manage their existing brand, I do offer a monthly Virtual Brand Manager option. Details in the slide below. Describe the genre of your venture. What are your biggest hurdles or roadblocks? What are the daily issues, or just the big crazy ones, that continually hold you back? Describe the size and scope of your business. Give me a little insight on team size, customer base, trends, forecast, and other assumptions and projections. What attracts you to my particular methodology and ethos? Describe what results you would hope for as a result of us working together.